Rob Kevlihan is Executive Director of Kimmage Development Studies Centre in Dublin, Ireland and Head of the International Development programme, Kimmage DSC at Maynooth University. 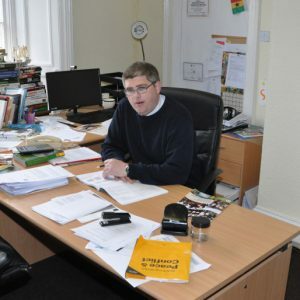 Prior to joining Kimmage DSC in 2013 he worked as a scholar, researcher and practitioner in the development, humanitarian, conflict and international relations fields for more than 15 years with extensive experience working in both Africa (including Sudan, Angola, Ghana and West Africa more generally) and Asia (both Central and South East Asia). A chartered accountant by profession, Rob also has a Masters in International Relations from Dublin City University and completed his Ph.D in International Relations at The American University in Washington, D.C. in 2009. He has published single and co-authored articles in a number of journals, including International Studies Quarterly, Disasters, Nations and Nationalism, Nationalities Papers, Ethnopolitics, The European Journal of Development Research, African Security Review and Small Wars and Insurgencies (forthcoming), amongst others. His first book, entitled “Aid, Insurgencies and Conflict Transformation, When Greed is Good”, was published by Routledge in 2013.